Alan Dershowitz Speaks on His "The Case for Israel"
1,100 at Royce Hall hear call for supporters of Israel in America to speak up. Watch it now using RealPlayer. Daniel Neuman: Thank you, Geoff, for that warm introduction, and good afternoon, everyone. On behalf of the Chancellor, Albert Carnesale, and actually the whole UCLA family I'm delighted to welcome you here today. I want to extend a special welcome to our featured speaker, Alan M. Dershowitz, the Felix Frankfurter Professor of Law at Harvard Law School. Professor Dershowitz, as you know, will speak about his new book The Case for Israel. We are very pleased, indeed, very honored to have him here at UCLA today. Today's program is sponsored by the Ronald W. Burkle Center for International Relations and the UCLA International Institute and also in affiliation with the Hillel Foundation. I wanted to commend Geoffrey Garrett, vice provost and dean of the UCLA International Institute, who has been a driving force in promoting UCLA as a national leader for discourse on international affairs. And I also want to thank Ronald Burkle for his generous support for this Center that makes this forum possible. UCLA has long been a forum for rational discourse on many topics. This presentation represents UCLA's on-going commitment to provide a campus locus for a wide range of views on key international issues. Our continuing objective is to bring a broad spectrum of viewpoints and thinking about the Middle East and other areas of the world to this campus and to our community. Burkle Forum speakers are international leaders in the breadth of their scholarship, the depth of their learning, and their encompassing commitment as teachers. And in these respects Professor Alan Dershowitz is indeed archetypal. Alan Dershowitz is a Brooklyn native who has been called, and I quote here, "the nation's most peripatetic civil liberties lawyer," and also I quote, "the best known criminal lawyer in the world." A graduate of Brooklyn College and Yale Law School, Professor Dershowitz joined the Harvard Faculty at the age of twenty-five after clerking for Judges David Bazelon [U.S. Court of Appeals] and Arthur Goldberg [U.S. Supreme Court]. He is perhaps best known for defending high profile clients: Claus von Bulow, O.J. Simpson, Michael Milken, Mike Tyson, among others, but perhaps less well known is that he represents numerous indigent defendants, taking half of his cases pro bono. 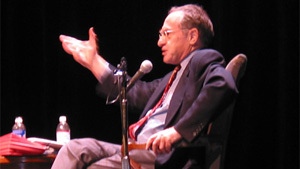 Professor Dershowitz has authored eighteen works of fiction and nonfiction, selling over a million copies worldwide. Over the years his work has garnered the praise of such literary giants as Truman Capote, Saul Bellow, David Mamet, and Elie Wiesel. His most recent nonfiction titles are: The Case for Israel, America Declares Independence, Why Terrorism Works, Understanding the Threat, Responding to the Challenge, and Just Revenge. If all that were not enough achievement for one person, Professor Dershowitz also penned a novel about the von Bulow case, Reversal of Fortune, which I am sure many of you have seen. It was later made into a film and it turned out to be an Academy Award-winning feature film. Ladies and gentlemen, please join me in giving a warm welcome to Professor Alan Dershowitz. Geoffrey Garrett: Okay, I'm back. I promise that all my questions will be only of one-sentence length. I will try to resist the temptation to make any editorial comments. So Alan Dershowitz, why did you write the book? Alan Dershowitz: Well, first, thank you all for inviting me and I must make just one correction. Though some of my critics thought that the book Reversal of Fortune was a novel, it was actually a nonfiction book. And the movie version of it was produced by my son Elon Dershowitz, who is here in the audience tonight. And it was a really good movie. It's a great pleasure for me to be here today. I went to Brooklyn College, which was the public college in the City of New York, and I have always thought of UCLA as kind of the brother/sister West Coast branch or version of New York City College. I have great affinity for UCLA because my favorite law student was a graduate of this fine university. You may have heard of him. His name, I think, was Bill Walton. He went on to do some other things and in basketball, but he finished a year and a half of law school and I've actually been trying to urge him to come back and complete his law degree. But thank you for your question and let me respond, because The Case for Israel is the book I didn't want to write. It's my least favorite book I have to tell you. Who would have to write the case for Canada or the case for Australia or even the case for France? Garrett: That's an impossible book to write, I have to say. Dershowitz: [Laughs.] But I had to write The Case for Israel because if you look at college campuses around the United States and, even worse, in many parts of Europe -- if you look at what's going on in the United Nations and in so many European capitals -- there are so many false allegations and accusations being made against Israel and so many believing them because they are not being given appropriate factual responses that I just had to write The Case for Israel. I wish I could write the case for peace. I'd much prefer to write a book calling on people to come together and proposing various solutions, which I think are possible. And I'll talk a little bit about, I think, the case for peace. But my own view is that before you can make peace and before you can make reconciliation you have to clear the air of these kinds of false accusations, accusations that Israel is the worst human rights offender in the world. Israel is a colonialist regime, that it engages genocide, that it commits crimes against humanity. You've all heard it. You've read it. You hear it on Pacifica Radio or other places and people tend to believe these accusations. And so there were several events that led me to decide to drop my other writing projects and to defend this pro bono client. One of them, of course, is well known to everybody: Israel in 2000 and 2001 made an incredibly generous peace offer to the Palestinian Authority. It offered 90 something -- there is some dispute -- but around 95 percent of the West Bank, 100 percent of the Gaza, a Palestinian state, with its capital in Jerusalem. It offered control of the holy places to Islam -- to Islamic control. It offered a $35 billion dollar refugee package. It was the dream offer. It wasn't the perfect offer. Obviously, Israel could have been more generous and perhaps if the Palestinians had said, "Yes, but," they would have gotten more. But the offer was quite a remarkable one. And then President Clinton twisted some arms, of Ehud Barak to get him to give a little bit more, having been assured by Arafat that Egypt and the Saudi Arabians supported the peace offer, [their position being that] as long as Jerusalem and the mosques are under the control of the Muslims we're okay with this. Arafat would sign on the dotted line. Instead Arafat walked away, having embarrassed President Clinton, having embarrassed Ehud Barak to the point of assuring his electoral defeat the next time around. And almost immediately thereafter, before Sharon ever walked on the mountain top [that is, Sharon's visit to the Temple Mount in Jerusalem's Old City on 28 September 2001 which was protested by the Palestinians--ed. ], which in my view was a foolish decision and a provocative decision, but before he ever did that, the Second Intifada began. That is, the use of violence as aid to diplomacy recommenced. It then spiraled out of control, as we'll talk about later. What happened after that persuaded me I had to write the book. And that is, shortly thereafter, when Israel, as every democracy does, overreacted to the murdering of its own civilians, the world turned against Israel on a dime. It was as if no peace offer had been made. It was as if Israel was totally responsible for the ensuing bloodshed. By the way, that wasn't the view of Prince Bandar of Saudi Arabia, who was one of the negotiators for the Palestinian side. He concluded that Arafat's decision to turn down the offers at Camp David and Taba were "crimes against the Palestinian people" and "crimes against all the people of the region." He blamed all of the then 3,000 deaths, now coming closer to 4,000, on Yasser Arafat personally. Reasonable people could argue about where the blame lies. There are some Israelis who think [the offer] wasn't generous enough and that's all perfectly reasonable and perfectly understandable criticism. But to see the world and the academic community so quickly forget what Israel had offered and turn so dramatically and ferociously against made it clear to me I had to write the book. Then two other things happened. One was the divestiture campaign. You'll remember that. Just about a year ago. An effort was made to get universities, like this one and like my own, to stop investing in companies that did business with Israel. It was such an irrational, immoral campaign, because what is Israel's major export today? It's not Jaffa oranges anymore. It's medical technology. Israeli medical technology saves more lives of people around the world per capita than any other country in the world. And yet Israel was being singled out for economic capital punishment, not other counties that were far worse. Not Libya. Not China, which was rewarded with the Olympics even though it has had an occupation of Tibet with more settlers that is much more brutal for a far longer period of time. And then it occurred to me that the campaign for divestiture wasn't intended to succeed. Nobody thought that UCLA would divest or that Harvard would divest. Obviously, that wasn't going to happen. All the major university presidents immediately indicated it was off the table. The goal was much more subtle. It was to miseducate a generation of American college students so that when they became the leaders ten, fifteen years down the line, they would have a kind of knee-jerk opposition to Israel of the kind that one sees in Europe. And I decided I had to respond to that. [The second thing] was much more personal and I think some of you students may be able to identify with this. Just about a year ago a student came to me and he said, "I'm ashamed. I'm embarrassed. I understand a lot about Israel. I've been to Israel. I've been to the West Bank. I know that what I'm hearing in some of my classrooms, what I'm reading in the Harvard Crimson, what I'm hearing at the lunch table, what I'm hearing in my house at night is not true and I don't ever speak up." And I said, "Why not?" And he said, "I'm embarrassed to tell you." I said, "Don't be embarrassed. I will never quote you by name." He gave me permission to tell the story, though. He said, "I don't speak up because I'm afraid if I'm perceived as pro-Israel none of the young women will go out with me. It is not cool to be a Zionist. It is not cool to be pro-Israel. It is cool to be pro-Palestinian." And I decided that I had to do whatever I could to help make it again be cool to support Israel. Not to support every one of Israel's policies. Now you know there is a simple solution. If you want to make it easier to support Israel, you know, date a Zionist tonight. But that's not the solution obviously. There's a more pervasive solution that one has to talk about. And that's why I wrote this book, which I really wish I didn't have to write, The Case for Israel. I believe that once the facts are known, the case for Israel makes itself. And I don't mean the case for Israel being the case for Sharon. I don't mean the case for the current Israeli government. I believe very strongly in criticizing Israel and criticizing any policy of any government of Israel as long as the criticism is comparative, contextual, constructive, and reasonable. That's not what we are hearing on campuses today. We're hearing criticism and condemnation designed to de-legitimate Israel, designed to demonize Israel, and designed eventually to create a generation of students who believe that Israel has no right to exist. So that's why I wrote the book. Garrett: Thanks, Alan. Your comments about what you argued was a turn in the United States against Israel after the failure of the peace plan and the intifada obviously makes sense in the American context, but as a foreigner living in the United States and somebody who grew up in Australia in the 1970s I wanted to ask you a broader political question. First of all, there's another phenomenon in the U.S. at the moment that, I guess, you alluded to, but I wonder if you could talk about it directly, which is Jews against Israel and how that works. But I think the broader global question as a political matter is that in the U.S. at least, the mainstream left tends to be seen as being a steadfast supporter of Israel and the criticisms that you are talking about don't seem to make it into mainstream politics very much. There's wide consensus in the U.S., it seems, on the left and right that support for Israel should be the basic policy of the United States. As you know, if you go outside the U.S., that's just not true at all. And since the 1967 war, in fact, I think it has been a central tenant of the foreign policies of many countries, many stable democracies in the world, that the center left is basically pro-Palestinian and not pro-Israel. So I'm wondering what you think about these broader global political issues? Dershowitz: Well it's an excellent question and whatever happens abroad is likely to come to the United States at some point in time. I agree completely with your description. I think it's very important to note that, because there's a lot of kind of liberal bashing that goes on among pro-Israel people. [They] say, "Oh, we've given up on the liberals. There's no hope for the liberals. The liberals are all against Israel." That just isn't true. In America today the liberal mainstream media is generally pro-Israel. The liberal political establishment is generally pro-Israel. Even the kind of liberal Hollywood is certainly not anti-Israel. What is virulently anti-Israel is the hard left, the hard academic left, the Noam Chomsky left on the American college campus, which is totally unrepresentative of the left in America. In fact, Chomsky can't even get a hearing among the left. He can't get on mainstream television. He can't get called to testify in front of Congress. He is regarded as completely outside the mainstream. But on college campuses he is the most influential academic, perhaps, in the world today. I agree with you, too, that among many European -- it's true in Australia; it's true in Canada -- to an increasing degree the left center has been pro-Palestinian and anti-Israel. By the way, I mean to make a sharp distinction. I'm pro-Palestinian. I'm just not pro the current leadership of the Palestinians. I think, in fact, the Palestinians have been victimized more by their own leaders than by any external country. But I think it's also increasingly true in many parts of Europe that the centrist right is turning against Israel. The hard right has always been against Israel, because there is an anti-Semitic hard right, which we don't have in America except for Pat Buchanan and a handful of other people like David Duke who, of course, are anti-Israel and anti-Jewish and anti-everything else. But, in fact, in America the religious right tends to be, for my mind, a little bit too supportive of Israel sometimes. They not only support Israel's right to exist. They support some of the most extreme right wing policies of any Israeli government. But very often when you go to Europe you hear the following. Sometimes it's done politely. Sometimes it's less polite. When I debated Robert Fisk [Middle East correspondent for the British newspaper The Independent] not so long ago, he said the only reason American foreign policy supports Israel is because pushy New York Jews contribute money to the coffers of both parties. It's interesting because you never hear that the reason why the French support the Palestinians and oppose Israel is because of pushy Muslims in Marseilles (one would never hear that and I would never use that except as a description of what you don't hear). Or you never hear that French policy is tilted because of oil needs. You only hear that [kind of talk when it is directed against Jews, as for example] the statement made recently by the Malaysian Prime Minister, that the Jews rule the world, the Jews rule America. It's pushy Jews. It's aggressive Jews. It's wealthy Jews who determine American foreign policy. That's just not the case. That's just not the fact. And the evidence, again, comes in part from the religious right, which certainly is not influenced by mainstream Jewish intellectuals or Jewish political contributions. In fact, Jewish mainstream people and the religious right are at each other's throats over issues such as abortion and gay rights and separation of church and state and basic democratic values. So I think that's part of it. The psychological or political or geo-political reasons why we've seen such a great tilt in many parts of Europe. One of the testing points, of course, is England. England, which supported the United States in the Iraq war and thereby separated itself from France and Germany and Russia, on the issue of Israel/Palestine, is closer to France than it is to the United States. Indeed, there was some risk that the United States, in order to make nice with Tony Blair, who was nice to the [Bush] administration over Iraq, [would pull back from its support to Israel]; that the one thing that the United States could give Tony Blair was to be tougher on Israel and to be able to have him tell his liberal colleagues, "See, look what I got for it. At least I got the United States to change its policy toward Israel and Palestine in the Middle East." By the way, I meet a lot of Europeans who are more critical of Israel in public than they are in private. There are Europeans, center left and center right, who privately are glad that Israel is there keeping democracy alive and radical Islam in check. But they are not ready to say that in public. And that, I think, also reflects a subtle point that has to be taken into consideration. But the reality is there. There is no question that there is a different perception of Israel in most parts of Europe than there is in the United States. If you just ask the simple question, positive or negative views, many, many more Americans will have positive views of Israel. Many, many more Europeans will have negative views of Israel. That is a realistic fact. It may reflect the fact that the generational issues we are seeing today, of college students being influenced by lots and lots of anti-Israel attitudes on campus, happened twenty years earlier in Europe. And so the current generation, Tony Blair's generation of leaders, will have been influenced by the post-1967 war, post-American Vietnam phenomenon [in a different way] than Americans will have been influenced. Criticism of "The Case for Israel"
Garrett: I'm sure many people in the audience have done what I did this afternoon, which was to use the wonders of Google technology and type in the words "Dershowitz" and "Israel." And as you know, what happens if you punch in those two words is you get -- and Google, remember, is supposed to be very unbiased technology, it takes the stuff that's most out there -- vehement criticism of your book. Notwithstanding the laudatory statements that are on the Amazon.com site, for example, you get out there into the masses and it seems that the mass opinion is both negative in terms of your opinions but also very critical in terms of your scholarship. I'm wondering whether you anticipated the extent of the criticism and how you believe you should most appropriately respond to it. Dershowitz: It's a very good question. As you know, I love controversy. And I knew that writing The Case for Israel would engender a tremendous amount of controversy. I actually predicted to my publisher that the most controversy would come from criticism from the Jewish left, which has turned out to be true, Tikun and people who associate with Tikun and from the Israeli left and from Israeli scholars, in general. The interesting thing that I didn't anticipate is how positive the reviews from Europe have been. The book got a rave review in the London Times and the London Examiner, and the Canadian Globe and Mail. But in the United States, the Los Angeles Times had a Jew who frequently bashes Israel making an interesting point. He called it "bombastic nationalistic defense" and made it seem as if I were an uncritical supporter of Israel. In fact, even this week's Los Angeles Jewish Journal describes my book as describing an impossibly virtuous country whose intentions are always pure, whose conduct is forever above reproach, etc. Of course, that's not my book. In my book I'm very critical of Israel. I'm very critical of the Sharon government. I'm critical of Israel's occupation policies. I'm critical of the settlements. I'm critical of the way the refugee problem was handled. But I'm regarded by the Jewish left as an extremist. Now it's interesting to make a comparison between me and the late Edward Said. Edward Said is regarded as a moderate by most American academics. I know he spoke on this campus. And remember that Edward Said broke with Yasser Arafat when Yasser Arafat signed the Oslo Accords. Said refused to recognize Israel's right to exist, refused to recognize the two-state solution. On a scale of extremism if you judged Palestinians and Jews by the same scale, Edward Said would be at about the point of Meir Kahane, and I would be smack in the center. But because of the double standard that's applied not only to Israel but also to supporters of Israel, I'm perceived as being on the extreme right, although were I an Israeli I would vote the Labor Party. I'd vote for Ehud Barak. I'd vote for Shimon Peres. I would have voted for Yitzhak Rabin. And I would have voted against Likud. And I'd probably be a member, though a critic, of B'Tselem [the Israeli Information Center for Human Rights in the Occupied Territories] and other human rights organizations. I am a supporter of ACRI [Association for Civil Rights in Israel] and I criticize far more than almost any Palestinian would criticize the Palestinian regime. So I anticipated that criticism and I was ready for it. The thing that absolutely blew me away was when -- and I should have anticipated this -- a group of rabid anti-Israelis, Alex Coburn of The Nation and Norman Finkelstein, decided to accuse me of what they had previously accused Elie Wiesel, Stuart Eizenstat, Joan Peters, Sir Martin Gilbert, virtually everybody who has written a pro-Israel book or a book demanding justice for Holocaust survivors: We're all called plagiarists, frauds, and hucksters. They are not even creative. They come up with all the same words to describe us. Now it's awfully hard to make these claims against my book but that didn't stop them. The Nation actually had a headline that reads "Alan Dershowitz, Plagiarist." Now here's the charge of plagiarism. Believe me, this is the charge because you are going to laugh hysterically when you hear it. They don't claim that there's a single word or sentence or thought in my book which is borrowed from somebody else and not enclosed within quotation marks. Every single word and sentence that I quote from somebody has quotations. It also has a citation. Here's their complaint. Their complaint is that I got several of the quotes, for example, one from Mark Twain, another from the Peel Commission, and several others from travelers to Palestine in 1870, from a book by Joan Peters. Therefore, I was not entitled to go back and check these quotes against their original source -- in Mark Twain's case, The Innocents Abroad -- and then quote it directly to Mark Twain. I was obliged to quote it to the book where I originally came across it. Now what makes it ironic is that the claim is that Joan Peters had borrowed the quotes from another guy named Frankenstein who had written a book called Justice for My People. He had borrowed it, perhaps, from other people who had borrowed it from other people. In fact, the Mark Twain quote has been around for as long as the Israeli/Palestinian issue has been debated. I used it in 1970, fourteen years before Joan Peters wrote her book, in a debate on national television and another debate with Noam Chomsky. So what would they have me do? Quote it back to where I originally found it. I remember where I originally found it. It's true I didn't read the whole Innocents Abroad. I came across the quote somewhere. And I do what other scholars did. I went back to the original, checked it, and then quoted it and sourced it to the original. I have 500 quotes in my book, 500 sources. Joan Peters has 2,500 sources in her book. On less than twelve occasions I used quotes that I found originally in her book and quoted them to the original rather than quoting it to her. Eleven times I couldn't find the original sources and I said, as quoted in Joan Peters. And dozens and dozens of times I simply found the sources myself. For example, the Peel Commission. That they call plagiarism. That's their case. And of course when the president of the American Academy of Arts and Science, the former president of Dartmouth, James Freedman, looked at it, he just scratched his head and said, "I don't get it. What's the plagiarism? Everything's quoted. Everything's quoted properly." The Chicago Style Manual says it's better practice if you can to go back to the original source rather than quote the secondary source, especially when the secondary source has been challenged and claimed to be "a fraudulent hoax which engaged in plagiarism." That's what they said about Joan Peters. So they then said the same thing about me. Of course, I responded to The Nation article and The Nation, then, had a response that they printed today saying, oh, no, no, no. You should have cited the secondary source, not the original source. And they got some professor from another school, who it claimed was neutral and objective, to say, oh, yes, I think he should have cited the secondary source rather than the primary source. Of course, when I Googled that professor I found out that he signs all kinds of petitions saying that Israel engages in genocide and crimes against humanity. It is clearly a politically contrived device designed to focus the attention away from the merits of my books, the actual arguments, which they refused to debate me on, and to engage in this sideshow. The first thing I did is immediately, when somebody used the word plagiarism, I brought it to the attention of the dean of the Harvard Law School, the president of Harvard University and said, please set up a commission, set up a committee and investigate, do anything you want. Everything I've done is absolutely right. And nobody has taken the matter any further. So I will have to respond to these charges. And the only point where I think I disagree with you is [if you] say that if you check Google you'll see a kind of representative sample of Americans critical of the book. It's not what's happened at all. "A New Form of Literary McCarthyism"
This is a concerted, organized, systematic campaign by a group of people who have decided to send a very powerful message and to use me to forward the message. And the message is a very simple one: if you are a young academic, not an old one like me, but if you are a young academic and you even are thinking about writing a book that's pro-Israel, beware. We will accuse you of plagiarism. We will go through your book with a fine-tooth comb. We will find a typo. By the way, Norman Finkelstein is writing a monograph -- a whole book on my book -- trying to find every mistake in every footnote. It's not going to work for me. He's not going to frighten me obviously. But he will frighten other young assistant professors without tenure into not writing pro-Israel books. This is a new form of literary McCarthyism. It is designed to chill and deter free speech. It will not work. They know that they can do it to me, and that because I believe so strongly in the First Amendment and full freedom of speech that I will not sue them for libel or slander, though it would be an open and shut case to win a defamation judgment against them. But I will oppose them in the marketplace of ideas. I will expose them for the political frauds that they are and for the ideologically biased critics that they are, and I will ask them whether they have ever gone and examined a book which is pro-Palestinian or anti-Israel and exposed it to the same kind of scrutiny. It is, I repeat, literary McCarthyism pure and simple. And it must be opposed and I will take the lead in opposing it. Garrett: Thank you. I only wanted to ask one more question, but I'm going to abuse my position to ask a second question so this is the penultimate question, which is directly stimulated by what you've just said. I'll just begin with an observation. The observation is that the academic culture wars not only run deep but they run a long way in politics. I don't know whether your invocation of Edward Said was quite timely, not only because he was here last Spring and not only because of his recent untimely death, but also because his name has been taken in vain a lot in Congress very recently. I don't know whether you have been following this, but the Higher Education Act is up for reauthorization. In fact, it passed the House today. And there was criticism on the floor of the House and in committee proceedings which basically said that Edward Said brainwashed a generation of academics and students on American campuses. That's the analysis. And the solution to this problem was going to be to have the Department of Defense and the CIA monitor international studies activities on American campuses. That's actually the legislation that was passed today by the House. So I'm wondering in a world where reasoned discourse is so hard to achieve and all that one sees is stridency of the forms that you have mentioned, how one can generate a productive and meaningful dialogue on Israel and the Palestinians? Dershowitz: It's an excellent question. First, let me unequivocally state my opposition to any legislation that would in any way impose Defense Department or any government controls on what's taught in the classroom. I grew up during real McCarthyism. I'll never forget Professor Elsa de Haas at Brooklyn College one day, in a political theory class, seeing a strange face in the back of the classroom and asking the young man, older than we were, to identify himself and he did. And then she asked him if he worked for the government and he said he did. And then she asked him if he worked for the Federal Bureau of Investigation, and he said he did. And she walked over. She was a very large woman and literally lifted this man up and carried him outside of the classroom and said, "When I teach my students, I make love to them and I do not want the FBI watching me making love to my students." And she threw him out. I would have done the same thing. There's no toleration, nor should there be, of any government intrusion in what goes on on college campuses. Moreover, American students don't get brainwashed. You get brainwashed in countries where you can't respond. We have a full and vibrant marketplace of ideas in American universities, and so long as no teacher ever takes out on a student with grading any views that are expressed in the classroom, then students have a full and free opportunity to dissent. That's why I favor blind grading. That's why, surely, it would be an offense against academic integrity for a teacher to grade a student negatively based on whatever the views that might be. And that's why that professor at Berkeley should have been fired a couple of years ago who wrote in his description of the seminar or course he was giving at Berkeley that any students who are pro-Israel will feel uncomfortable in this class and should enroll in a different section. That is unacceptable in academic life. But universities are fully capable of monitoring their own teachers and their own students. By the way, the answer to Edward Said is simply more people speaking on all sides of the issue. Edward Said was not a brainwasher. He was a teacher who had a point of view, which, in my view, was wrong in many respects. He was much criticized, as you know, for having faked some of his own biographic background material about his early youth. He was criticized, but I defended his right. He was criticized for throwing rocks along with his son at Israeli soldiers at a checkpoint in Lebanon, but my friend who was the provost at Columbia University at the time, Jonathan Coles, sought the advice of many people. I don't remember whether he sought my advice, or I gave it to him unsolicited, but I said that surely Edward Said should not be disciplined or fired for that form of symbolic speech, though he should be criticized in the marketplace of ideas. And I both defended his right to throw the rocks and criticized him in the court of public opinion for so doing, particularly in the presence of his son. So I think we have to have more dialogue. As I said in my [response to the] first question, I wish I had the luxury to write a book which is more conducive to a nuanced dialogue about peace in the Middle East. And that's your job. My job as the defense attorney was to clear the air of false charges. Once the air is cleared of extremist false charges then a more nuanced debate can occur. By the way, one of my criticisms of the kind of uncritical acceptance of Palestinian terrorism by some and unwillingness to accept Israel's right to defend itself by others -- there are two terrible effects beyond just the bias and the double standard. One, it actually promotes violence. People have a moral responsibility to recognize the fact that when they reward terrorism, they encourage it. When the United Nations, after twenty Israelis are murdered in Haifa, and Israel responds by maybe foolishly, maybe improperly, but responds by killing no one in an empty base in Syria, and the result of the killing of the twenty and the Israeli response is a one-sided Security Council debate only condemning Israel, then the message to the terrorists is, do it again, do it more, you win, you benefit. And so speech, just uncritically accepting Palestinian terrorism, actually may result in bloodshed. You have moral responsibility for your words and your actions. The other point, which is much more subtle and it's one I feel very strongly, is that the un-nuanced criticism of Israel, the "you're the worst, you're a human rights violator, you're genocidal," makes it hard for people like me to present nuanced criticism of Israel. Because we don't want to become part of the cacophonous chorus of condemnation, which is immoral. This [is the] argument by ethnic admission, the argument that goes something like this: see, even a Jew like Dershowitz, or even a Zionist like Dershowitz, agrees that . . . therefore, it must be so. See, even a Jew like Norman Finkelstein. . . . See, even an Israeli like [former Israeli justice minister] Yussi Beilin. . . so it must be so. It's an illogical argument by ethnic admission. Just because a Jew argues the earth is flat or the Holocaust didn't occur doesn't make those facts true. They are false facts. Israelis are super critical of Israel, and appropriately so. It's their country. Just like Americans should be super critical of America. It's our country. But no one else has the right to apply that kind of double standard. And, in addition to imposing a historic double standard against the Jew among nations, it also, I think, increases violence because it encourages it and it also makes nuanced criticism somewhat more difficult. So my message is be critical of Israel. Be critical of every country. Make the case against Israel if you want to. Make the case against Jordan. Make the case against Egypt. But make it in a nuanced, comparative, and fair manner. And then, I think, we can go forward with debates about peace and about progress. Garrett: I wanted to end by asking you a question which is not about reflection and looking back in defense as you suggested, but the forward-looking one, which is simply to ask you the hard question, do you have a personal peace plan and how would one move forward? Dershowitz: Yes, I do. And let me tell you first what the worst possible solution would be. And it's the vulgar solution that we're hearing today. You read it in the Los Angeles Times last week. You read it in New York Review of Books. You hear it from Noam Chomsky. You heard it from Edward Said. The one state, secular, binational Palestine or Canaan, or whatever you want to call it. Nobody suggests calling it Israel because, for a very simple reason, there is a binational secular state already in the Middle East. It's called Israel. It is a secular state. It is binational. It has 1.3 million Arabs. And it satisfies all that definition. But know what they have in mind is merging the current Israeli population with the Arab population on the West Bank and the Gaza and creating one state out of what should be two. Just think of the precedence for that. Lebanon tried that. It ended in genocidal slaughter and bloodshed. The former Yugoslavia tried that. It ended in genocidal slaughter and bloodshed. And India and Pakistan would have ended in genocidal slaughter and bloodshed had it not done the right thing in separating itself into two states. Two states when you have two peoples and two different ethnicities and two dominant religions are far better. I don't want to seem flip about this but there was one leader in the twentieth century who tried to create a one-state solution for Europe. His name was Adolph Hitler. He tried to end the independent existence of France and Italy and Denmark and other countries. No, I think that the two-state solution is the only appropriate solution. It's the one I have always advocated. It's the one I continue to advocate. It's the one that very few Palestinian leaders actually advocate. They are not prepared to say two states. They are not prepared to say, as Mahmoud Abbas (Abu Mazen), the first of the many rotating prime ministers that we'll see, [would not say], "I recognize the right of Israel to exist as a Jewish state." He refused to do that, keeping open the possibility of Israel's demographic destruction by a so-called right of return which would end up with Israel having a majority Arab Palestinian population. So when the Palestinian leaderships want their own state more than they want the end of the Jewish state, there will be a two-state solution. Until very recently, clearly, the Palestinian goal was not the creation of a Palestinian state. At the Peel Commission [in 1937], when they were asked about that, they said Palestine is an invention of the Zionists. All we want is no Jewish state. We want to become part of Southern Syria. They could have had a state in 1947. No, they wanted to end the Jewish state. They could have had a state in 1967. They could have had a state in 2000-01. Now perhaps the leadership realizes that there will not be an ending of the Jewish state, and there will be a Jewish state of Israel in that area. And if the Palestinians want their own state alongside the Jewish state, as Michael Waltzer, the very liberal academic from Princeton, has said, there will be a two state solution. Now here's my road toward it very briefly. I think Israel should take the first step. And I think Israel's first step should be an announcement that it is prepared to end -- they have already made this statement -- most of the settlements. Sharon has made that statement, but they [should say they] are prepared to dismantle specific settlements on a date certain. Say, January 1, 2004. But it will be conditional on several things happening between now and January 1, 2004. That is, Palestinian best efforts to dismantle terrorist groups, starting out with the terrorist groups that operate under the Fatah or PLO movement and moving toward the more difficult task of dismantling Islamic Jihad and Hamas, which are supported by Syria and Saudi Arabia and Iran and other countries. If there were no terrorist acts between now and January 1, the settlements would be dismantled. But you never want to give the terrorists the veto. So even if there were terrorists acts, as there will be, between now and January 1, if the Palestinians had made best efforts, if the Palestinian authority has taken significant steps, to be determined, say, by a joint commission composed of Americans and Canadians -- it has to be a group that has credibility to Israelis and to Israel -- then Israel would dismantle. If best efforts were not made during that period of time, the dismantling would be postponed. The reason for that is very important. You cannot ever reward terrorism. You must always reward steps taken to end terrorism. The United States cannot be fighting Al Qaeda terrorism with one hand and be part of any process of rewarding it with another hand. As [New York Times columnist] Tom Friedman, the very liberal supporter of a two-state solution, has said, "If you reward Palestinian terrorism over there, it's coming to a theater near you." So I think that's my proposal. I'd love to see a two-state solution. I'd love to see peace. I think that if the Palestinians had accepted Camp David and Taba they would today be the wealthiest per capita Arabs in the Middle East. They would have a Marshall Plan. They would have a wonderful educational system with universities open to democracy. I hope they will amend their constitution to not have an established religion of Islam, just like I would like to see Israel change some of its basic laws and have less of a hegemony by the Orthodox Jewish religious establishments in Israel. And one could, and should, be critical of various aspects of that. Having said that, Israel of course is a secular democracy. The only people really who suffer under the religious hegemony in Israel are religious Israeli Jews who are non-Orthodox -- that is, conservative and reformed Jews. Secular Jews couldn't care less about the rabbinic establishment. Arabs have their own and Muslims have their own. There are Christian and Muslim religious establishments. And so there is much to be done to improve Israel. And if we ever get a two-state solution we can then put our [efforts into promoting] progress toward making Israel an even more vibrant and more responsive democracy. Garrett: Paul Krugman, the noted international economist and now [a professor at Princeton University], the conscience of the American left, I think some people have called him, said today that one shouldn't blame Mr. Mahathir Mohamad [for his statement that "Jews rule the world by proxy"]. One should understand the political circumstances in which he exists. This is the prime minister of Malaysia. And the claim was that Mahathir says things like that to give him cover because he really wants to change the Muslim world and so give him a pass on these outrageous statements. They are for domestic consumption and try to support the reforms that he really stands for. I was wondering what your reaction to that line of analysis about the Muslim elite would be? Dershowitz: Well I certainly don't agree with that analysis. He also said that part of the reason why the prime minister of Malaysia said it is because America's one-sided policy toward Israel pushes him in that direction to try to get cover. Look, there's only one cause of anti-Semitism and that is anti-Semites. Jews are not the cause of anti-Semitism, and in a world that is a small global village there is no such thing as domestic consumption. Hitler got elected on a platform of trying to criticize and condemn Jews for domestic consumption. And then what started out as domestic consumption became international reality. The good news about the Malaysian prime minister's outrageous statement is that the Europeans immediately condemned it. That was very good news. Also, our president condemned it, although after the Krugman article came out, this morning's news was that the Malaysian prime minister issued a press statement saying that George Bush did not condemn him for saying it and that he repeats it and reiterates and that it was taken out of context. I think it's very important that this kind of statement not be tolerated and accepted and it's important that the European community sees that. Now the European community does make a sharp distinction between anti-Semitism and anti-Zionism. And when that line is crossed as the Malaysian prime minister crossed it, it becomes easy -- in fact, it becomes desirable -- for European politicians to immediately say that line has been crossed. Had the prime minister of Malaysia put it a little more artfully and had he made the statement more of an anti-Zionist statement of the kind one hears today on some college campuses, I think he would have gotten a pass on it. But I do not think you give anybody a pass, whether it be [anti-Semitism or] the American general who made outrageously bigoted statements about Islam and about his God being bigger and stronger than the God of Islam; you don't give a general a pass on that kind of statement. Bigotry gets no pass from anybody. Garrett: Thank you. I've now started to go through the multitude of questions, which I have to say were very well formulated and also were not formulaic, in the sense that many of them seem to have reacted to specific things that you've said, so that's testimony to the fact that everybody is paying close attention to the proceedings. I apologize to people whose questions I won't be able to read. The first one concerns life on campus that, I guess, many people in this room are probably quite concerned about. The question is, given your criticism of what you characterized as a coherent, well-marshaled attempt to change the views of a generation of college students who will become ever more influential in the world in coming decades, given your view that that's what the academy is doing and given your views about academic freedom, how do you balance campuses whilst maintaining the tenets of academic freedom? Dershowitz: It's a very good question. Let me be clear. I don't think that academia is doing that. I think most deans and chairs of departments and responsible academics would like to see a fair dialogue on the Middle East. I think there are a small number of very vocal and committed hard left people, many of whom are also very anti-American. Noam Chomsky says the axis of evil is the United States, Turkey, and Israel. Now why Turkey belongs there, except that you need it for a sandwich, I have no idea. But that's his worldview. It is not typical of academia. It is not typical of the United States. There was a book written a couple of years ago about Mid-East Studies departments in the United States, trying to do an analysis of whether there is a funding bias to Mid-East Studies departments. As you know, Saudi Arabia has funded considerable numbers of chairs in Middle East Studies. That's a fair point to look at, but not from outside. I don't want any Congressional hearings on this. I think it's something universities can look at. I think the important point is to make sure that academic standards are maintained. That is, to make sure that qualified teachers teach the classes; that they teach them fairly; that they do not grade according to ideology; that they reserve the right to dissent, not only the right to dissent from the teacher, but protect the student from other students booing and hissing if he or she tries to make a point that's unpopular in the classroom. Teachers ought to present the devil's advocate view. I know I do that in all of my classes. I am a strong opponent to the death penalty and I make the case for the death penalty in my class because I know that there are very few students who are prepared to make that case. And it has to get made. And I think teachers always have to make the case for the views that they don't necessarily agree with. But I think the major problem is not within the curricula itself. I think the major problem is outside the curricula, the fact that, and here I am going to get a little bit personal. I am not really opposed personally to the Noam Chomskys and the Edward Saids. They believe what they believe. That's their ideology. They believe that. They're wrong. They believe it. They have the right to be wrong. My big gripe is against pro-Israel professors, primarily, though not exclusively, Jewish, on college and university campuses around the United States who don't have the courage to stand up and speak their mind, who are terrified about being perceived as uncool or divisive, who don't want to carry the label Zionist publicly, though they are prepared to carry it privately. Whenever I speak out at Harvard, I always get three or four phone calls the next day and they go something like this: [whispering] "Alan, thank you so much." What are you whispering about? Nobody's listening. These are cowardly professors who don't understand the meaning of tenure. Tenure means never having to be frightened of the implications of your views. Tenure means you have an obligation to speak your mind, so I am shaking my finger if any of you here or if any of you know people who are personally pro-Israel, who personally know that the points of views being presented on college campuses are often skewed but don't have the courage to speak out, that's where I think the big problem exists. There are some colleges in the United States today, some universities I know, because I've been following up on this, in which there is not a single faculty member who is prepared to speak up on behalf of Israel. Now you are blessed here at UCLA because you have considerable numbers of faculty members and others who are prepared to engage in the dialogue. But there are several colleges, major colleges in the United States, where you have many, many pro-Palestinian and anti-Israel voices and not a single faculty voice [to present the other side] and that makes it very difficult for students, many of whom are very courageous and are willing to speak out, but they are attacked and criticized bitterly when they do so. At Harvard last year a man named Professor [Paul] Hanson, the house master at Winthrop House, signed the divestiture petition and then some students called him for a session and he had a session in front of the students and he berated pro-Israeli students, just insulted them. That's when I challenged him to debate me, and he wouldn't do it. He is a professor of Bible Studies, Old Testament Studies. And one of the students said, "He can't debate you. He doesn't know anything about the Middle East subsequent to the death of Moses." But I debated him nonetheless with an empty chair and with his name on the petition and hundreds of students showed up, many with very open minds about this. And when they heard different facts from what they had heard previously they were certainly prepared to leave the room with an open mind. That's what we need. We need open-minded students and faculty members, not empty-minded ones, ones who have the knowledge and information and who can come to their own nuanced conclusions. Garrett: I am going to now read a question. Most of the questions were posed anonymously. We didn't ask people to write their names. But I am going to read one from somebody who did put his name on the question and then he has some stuff after it. I am not sure what it means, but it's "HLS 58." Dershowitz: Harvard Law School 1958. Yeah! Even before I got there. I got there in '64. Garrett: Well, thanks very much for enlightening me. The question has to do with leadership on the Palestinian side and, in fact, in the Arab world more generally. You mentioned the revolving door prime ministership that seems to be at least in prospect in the Palestinian Authority these days. Obviously questions about in whom to invest in Iraq and other countries in terms of leadership are very ripe ones, if it is true, as most people, even on the left in the U.S., believe, that Arafat can no longer deliver. Are there leaders in whom the U.S. should invest in the Palestinian Authority and in the Arab world and how appropriate would it be for the U.S. to play an active role in that rather than allowing the democratic process to play its will out? Dershowitz: It's the hardest question of all, of course. If the United States tries to invest in a leader, it immediately delegitimates that leader. For example, you will have a man here tomorrow, [Sari] Nusseibeh, who is a progressive Palestinian leader who has joined together with progressive Israelis to try to come up with a peace plan, which both the Palestinian Authority and the Israeli government have condemned and rejected, which means there must be something good about it, at least worthy of discussion and consideration. But the United States can't create puppet leaders. And it can't install leaders. The one point on which I disagree with the question is that I think Arafat could deliver. He just won't. He could have. He could have accepted Camp David and Taba. He could have. He promised Clinton he would if certain concessions were made and then the concessions were made and he didn't have the courage to do it. To be a great leader requires that you have the courage to make peace on the ground. He could have been a great Palestinian figure. I believe that the Palestinian leadership has been so disastrous over the years. When you think about the first great Palestinian leader, it was Haj Amin al-Husseini, the Grand Mufti of Jerusalem, the man who became an ally of Hitler during the Second World War, the man who started ethnic cleansing and terrorism in Israel, and the man who was an indicted war criminal after the Second World War, the man who Edward Said described as the authentic popular leader of the Palestinians and Yasser Arafat just a year and a half ago described as "our hero." He was a terrible leader. He wanted to see the end of the Jewish state much more than he wanted to see a Palestinian state. I think Arafat has been a terrible, terrible leader. I think Mahmoud Abbas (Abu Mazen) could have been a decent leader, had he had support on the ground. I think the current prime minister, if he had support on the ground. . . . The problem is that polls demonstrate he doesn't. Eighty percent in a poll reported on CNN the other day, I think it was a Birzeit University poll, showed support for the terrorist bombing that killed twenty Israelis, including five Israeli Arabs, in Haifa last week. You know, with that kind of support it's awfully hard to find a democratically elected leader who can produce peace. Now I haven't seen poll results that indicate how many Palestinians would accept a genuine two-state solution, that is the existence of Israel as a Jewish state; no right of return; financial compensation; a Palestinian state, roughly built on the basis of the Camp David and Taba agreement. I don't know what the polls would show. But there are two kinds of leaders. Leaders that follow the flock -- and if you have a leader that follows the flock you are not going to get peace in the Middle East -- or leaders who are prepared to take a courageous stand for peace. Leaders who are prepared to risk not only their political futures but also their lives the way President Sadat did, the way Rabin did, the way King Abdullah the First did. All of them ended up being murdered. And you have to risk that in order to make peace. We hope that we will get a leader that will risk it and not be killed. I am very much against any attempt to kill or exile Arafat. I think he does today represent mainstream Palestinian views and that he has to be, in some respects, dealt with. I'm not optimistic. People ask me, will there be peace in my lifetime? I don't know the answer to that but I don't think there will be peace in Arafat's lifetime. And were Arafat to pass there might very well have to be a civil war. I don't know whether Hamas would give up its guns. Remember what David Ben-Gurion did -- and that's a real model for a Palestinian state. The first act that David Ben-Gurion took as a Jewish prime minister of a Jewish state was to kill Jews. What he did was he shot and sunk the Altalena, a ship coming into the harbor loaded with arms destined for the Irgun and for other paramilitary groups. And there were Holocaust survivors on that boat. And there were Jewish soldiers on that boat. And Ben-Gurion ordered the shelling and the sinking of the boat, which killed several people. But he said, in order to be a state there must be a monopoly on arms. And he disarmed the Irgun. He disarmed the Stern Gang. People forget he also ended the independence of the Palmach, which was his essential military group. And he merged the Palmach into the IDF [Israel Defense Forces] and created a military structure under civilian control where the civilian authority is the only ones that can order any activity. Complete hierarchy of control. Like in the United States. Israel now has it. Palestinians don't have that. And eventually they will have to. If there is going to be a peace. Now this new proposal that you'll hear about tomorrow [see "Former Israeli Security Chief, Palestinian University President Get 153,000 Signatures on Petition for Peace"] talks about a disarmed Palestinian state. What that means in real practice remains to be seen, but the leadership so far has been terribly lacking and there doesn't seem to be any young indigenous leadership coming forward, either. Garrett: I wanted to commend members of the audience for adhering so strictly to the dicta, which I think I enunciated in my bad Australian. One was to be concise. The other was to be legible. Here are two tough questions, but I'd only like you to answer one of them. You can probably choose. So the first question is, do you still feel O.J. is innocent? Dershowitz: [Laughs.] Let me respond to that briefly by showing you that it has an Israeli connection. Okay. This is a good story. It's right after the O.J. case and I'm in Israel and the new prime minister has just been elected and turns out to be a man who I knew when he was a student at MIT -- not very well, but I knew him -- and his name was Benjamin Netanyahu. So he invited me and my wife and my daughter to come to their home and to meet him and to shake his hand. And we did. And then after we had a nice cordial he takes me into a kind of inner sanctum and he said, "This is the most secure room probably in the world. Nobody will overhear what we are saying in here. Alan, did he do it?" Garrett: Was there an answer, I have to ask. Dershowitz: So I said, "Mr. Prime Minister, does Israel have nuclear weapons?" He said, "I can't tell you that." I said, "Ah, ha. I can't tell you that." First of all the question presupposes a fact, namely, do I still believe O.J. Simpson was innocent? I never believe any of my clients are innocent. I operate on an assumption, a working assumption, all the time -- a presumption of guilt. That's the way you have to operate as a criminal defense lawyer. You have to be agnostic on the issue of innocence or guilt. And in the end maybe you come to some conclusions. Maybe you don't. But surely they are not conclusions that I would be able or willing to share with anybody, even my mother or my wife or my son. How Can Israel Stop Palestinian Terrorism By Nonmilitary Means? Garrett: Okay. Here was the other example of a succinct and extraordinarily legible and, I think, wonderful question that someone in the audience asked. So I'll just read it word perfect: what is the best nonmilitary action that Israel could take to stop Palestinian terrorism? Dershowitz: That's a very, very good question. It's a question that every Israeli leader should be asking all the time because military options are always a terrible, last resort. They are a particularly terrible last resort when terrorists deliberately hide among the civilian population. And that's a point that I think is often missed in this debate. The reason that Israel has killed more than 3,000 Palestinians in the past three years, most of whom, by the way, who were combatants -- the number of civilians actually killed has been greater among the Israelis than among the Palestinians -- is because the terrorists quite deliberately hide among civilians, putting Israel to the choice of either letting them go and letting them continue their terrorism or risking the death of civilians. It's a terrible choice. The Iraqi's did the same thing and it forced the United States too often to kill civilians. So I would hope there would be some nonmilitary solutions. One of which is the kind I suggested before: a clear announcement of an end to the settlement policy, a clear announcement of a willingness to end the occupation, conditioned on Palestinian terrorism ending or, at least, best efforts. The other one, of course, is the infamous wall. Now I support the wall in Gaza. The wall in Gaza has been a one hundred percent success. It has reduced to zero the number of infiltrations from Gaza into Israel. Of course, they are now developing rockets, which can fly over fences and walls and so it's not a permanent solution. I hate walls. I wish nobody needed them, and I might vote against it were I an Israeli. But I can't criticize Israel on moral grounds were they to want to build a wall on or close to the green line. What I don't like is the idea of creating a security wall with political implications and implications for the ultimate resolution. And it's almost inevitable that you are going to have, if you have a wall, a wall that establishes facts on the ground. I wish you could have a movable wall, a wall on wheels, but that's not realistic. So if I were Israeli I would hold off on the project of the wall, perhaps build some parts of it in vulnerable areas where there are no land confiscations necessary to do it and which are close to the border. But I surely would not build a wall around the Ariel settlements or any of the other external settlements. I think that would be a terrible mistake. Having said all that, I think all of these things are potential provocations: the settlements, the occupation, the checkpoints, the wall. None of them are the basic cause of terrorism. Terrorism has been a choice, an option, developed by Palestinian leaders, not by Tibetan leaders. The Dalai Lama, whose people have been occupied longer than the Palestinians, more brutally, with real cultural genocide taking place, with many more settlements in Tibet than in Palestine, have never resorted to terrorism. If Israel didn't exist, the Palestinians would be the Kurds of that area, nobody would care about them. The Arab states couldn't care less about the Palestinians. The only reason they care about the Palestinians is because they are opposed to the Israelis. That's why they don't care about the Kurds. If Arabs cared about statehood for indigenous people, they would be on the forefront of Kurdish independence, and yet Kurds can't even get a hearing at the United Nations. So I ask all of you, by the way, who are supporters of Palestinian statehood, as I am, I ask you whether you are also a supporter of Kurdish statehood? Are you also a supporter of Tibetan independence? Are you also a supporter of statehood for Armenians in Turkey? If you are not, don't call yourself a human rights activist. Call yourself a particularistic opponent of Israel. Why Is the World So Focused on Israel? Garrett: That's actually, again, a wonderful unscripted segue to what unfortunately, I think, will have to be the last question. The last question, again, is simple and legible, but it strikes me as being pretty important. Why is the world so focused on Israel considering that it is such a tiny country? Dershowitz: Why is the world so focused on Israel? And why is the world so focused on Palestinian statehood? Why has the Palestinian cause been leapfrogged ahead of the Tibetans at the U.N.? The Tibetans can't get a meeting at the U.N., can't even get into the building. They can't get to see the Pope. They can't get to many, many institutions. Yes, the Dalai Lama can get a hearing in various places. Why not the Kurds? Why not the Armenians? Why not the Chechens? Why not so many others? Why are the Palestinians leapfrogged? Well, there are several reasons. First, terrorism. They have mastered the art of using terrorism to bring themselves to the attention of the world. And they should not be rewarded for that. Second, they are lucky because the group that they claim oppresses them happens to be the Jew among nations, not the most popular group in the world. It's much easier to oppose the Jewish nation than to oppose China, or to oppose Turkey, in the case of the Armenians, or to oppose other stronger countries. This leads me to the third reason, and that is oil. The allies of the Palestinians are oil-rich nations. And the fourth reason is because Israel is seen as a surrogate in many parts of the world for the United States. And a lot of anti-Americanism really manifests itself as anti-Israel bashing, particularly on college campuses. You know, scratch an anti-Israeli deep enough and I think you'll find strong anti-American attitudes of the kind expressed often by Noam Chomsky. And by the way, in the Middle East scratch an anti-Semite and you will often find an anti-Christian. A lot of the opposition is to the Judeo-Christian heritage and civilization. One hears about the crusader Israel -- you know people forget that crusaders killed Jews, too. And the Jews, along with Muslims, fought the crusaders in Palestine a thousand years ago. But the question, the deep psychological question about why the Jews is a question that [conservative columnist] Dennis Prager has asked. It's a question Sigmund Freud has asked. It's a question Karl Marx asked and answered wrongly. It's a question that Sartre has asked. It's question that many people have asked. It's beyond my competence to probe deeply, but I know bigotry when I see it. And for those of you out there or for those of you who have friends who are unthinkingly anti-Israel and unthinkingly pro-Palestinian no matter what course of action they take, you are on the wrong side of history. You are on the wrong side of morality. And if ever tragedy were to strike, as it did in Europe in the 1930s and 1940s, you will have a terrible time living with your own consciences. You are good people. Please, read, learn, debate, argue, listen, learn, keep an open mind. If you do, you will come out with a far more nuanced view, a far more balanced view, a view that shows there are rights and wrongs on all sides and a view that will lead us toward the possibility of reconciliation. Because the extremist views only lead to Armageddon. The extremist views inevitably lead to extremist solutions. So my hope for all of you is to keep learning, keep studying and if you know the facts you won't have to make the case for Israel, the case will make itself. Thank you very much.